Cross Street in Island Pond. This month on 'Brave Little State,' we try to answer a listener question about just how "different" the Northeast Kingdom is from the rest of the state. 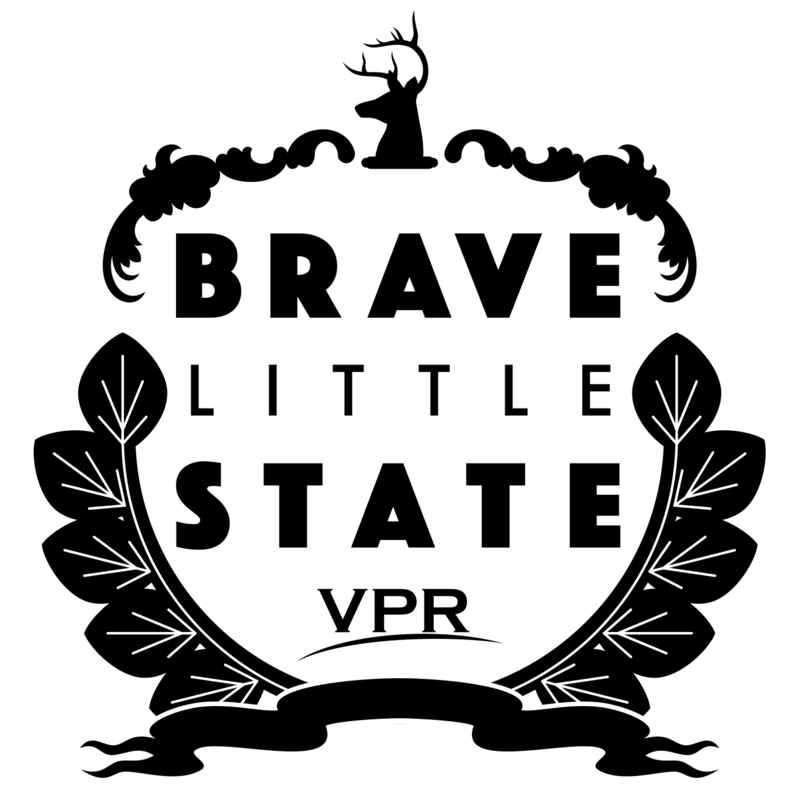 That’s what Walter Parenteau asked Brave Little State, VPR’s people-powered journalism podcast. Editor's note: This episode is loaded with voices from the Northeast Kingdom and excellent music by NEK native Patrick Ross. We highly recommend listening in the player above! Our brave question-asker this month is Walter Parenteau, a native of the Northeast Kingdom who recently moved back after more than 15 years out of state. Walter grew up in Westmore, and now lives in Brownington — both towns in Orleans County, which, along with Essex and Caledonia counties, make up that region of Vermont known as the Northeast Kingdom. “I left the state when I was 19. And I’ve been away for the better part of the last 16 years. And I just moved back,” Walter says. But his question doesn’t stem from a reaction to his homecoming. Walter says he was a student at Lake Region Union High School in 2000, when Gov. Howard Dean signed Vermont’s civil unions law. Walter says that now that he’s back in the Kingdom, he’s much more confident than he was as a high-schooler — and he acknowledges that when it comes to LGBTQ issues, a lot has changed in general since the early 2000s. So at this point, he’s just generally curious about what does or doesn’t set the region apart in terms of things like politics, religion and the economy, and the way those things shape culture. “I know that we say, ‘Oh, [the] Northeast Kingdom is different,’ when we look at a brochure, when we see it in a commercial, when it’s on TV,” he says. Walter also wanted to know: What’s with the name? For that we can turn to a resident chronicler of Northeast Kingdom past and present. Scott Wheeler hosts a radio show and a TV show and publishes the Vermont's Northland Journal — all with a focus on the Northeast Kingdom. In 2010, he interviewed Lola Aiken, the widow of George Aiken, the Vermont governor who became a U.S. senator — “the man who coined the phrase Northeast Kingdom,” Scott says. The Aikens were big fans of the northeast corner of the state — especially Island Pond, where “the governor,” as George Aiken was called, liked to fish. The story goes that said governor (who was technically a senator at the time) uttered the phrase “Northeast Kingdom” at a regional development meeting at the Darling Inn in Lyndonville, in 1949. Brave Little State met up with Scott at an Italian restaurant in Derby to talk more about this. Scott says it wasn’t just by chance that the region got a catchy name. “What was going on before the meeting was, in the years before, [business groups] were trying to come up with a way — the area was beautiful, but it was also poverty stricken. And so they were trying … to figure out how to brand this area. It wasn’t just to get people to see it, but it was also to bring economic commerce here,” Scott says. George Aiken, who served Vermont as a governor and U.S. senator, is often credited with giving the Northeast Kingdom its name. But this 1949 report from the Caledonia Record suggests he may have borrowed the phrase from someone else. Since he interviewed Lola Aiken, Scott says he’s become less certain that George Aiken did indeed coin the term; he’s read an account that suggests Aiken may have heard it somewhere else, and just repeated it. But regardless, Scott says Aiken was the one who popularized it. “No matter who coined that phrase, if the tri-county area had never been coined ‘Northeast Kingdom’ or anything else, I don’t think that we would be thinking of ourselves as a particular region” he says. And in Scott’s mind, it was kind of a random grouping of three counties. That’s true, by the way. According to American Community Survey 5-Year Estimates, Orleans and Essex Counties have the highest poverty rates in the state: just under 15 percent. Caledonia is in the middle of the pack, with Rutland, Orange and Chittenden counties, at around 12 percent. But Scott says that kind of thing doesn’t stop people from mentally lumping the three counties together into a single place with a mythic name. It isn’t a totally arbitrary region, though. (You might remember from our episode on Vermont’s geology that parts of the Kingdom have bedrock more similar to New Hampshire than the rest of Vermont.) And it’s also basically hemmed in by the Green Mountains and the White Mountains. “As a result, just in previous time, it was a little more difficult for people to reach the Northeast Kingdom,” says Mark Breen, the senior meteorologist at the Fairbanks Museum, the home of VPR’s Eye on the Sky weather forecasts. Mark says those same mountains block something else from coming in: warm weather. And even when there’s not snow, there’s frost. And on top of all that? There’s not even much sunshine to be had. Hear Northeast Kingdom resident Carl Blaisdell talk to Erica Heilman about the weather. 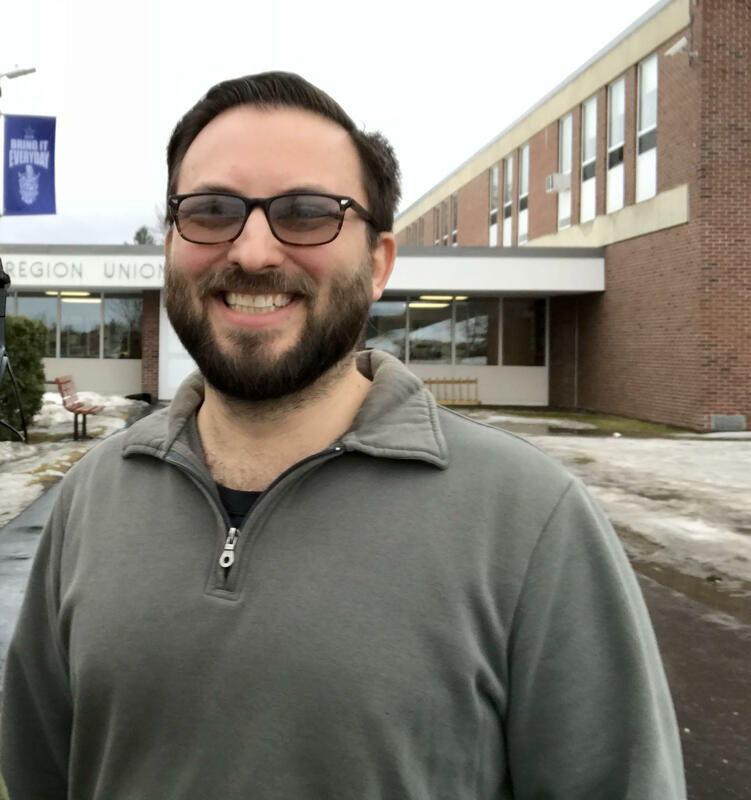 “Yes, the Northeast Kingdom is quantifiably more conservative and more Republican than the state as a whole,” says Lachlan Francis, a senior at the University of Vermont and a double major in political science and geography. When Lachlan spoke to Brave Little State, he had just gotten back from a student political science conference in Washington, D.C., where he was presenting a paper he had done on voting patterns in Vermont. Lachlan disclosed to us that he’s worked for the Democratic Party on state and national campaigns. But for this project he was just crunching numbers from the Vermont Secretary of State’s office, and then mapping them. Analyses of presidential election results from 2000 to 2016 show clusters of Republican support in the Northeast Kingdom, as well as other parts of the state. 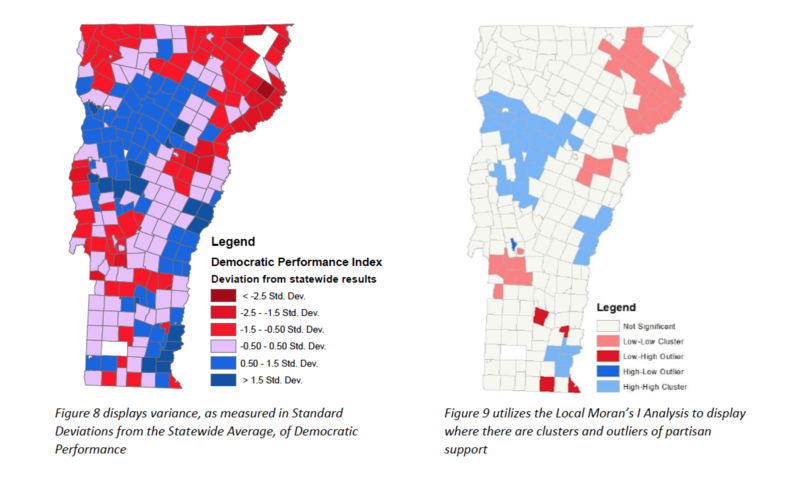 “From there I observed that … Republican support was clustered in the Northeast Kingdom, all over the Kingdom, as well as in parts of Rutland County and certainly in the more rural parts of Franklin County, outside of St. Albans City,” Lachlan says. “I think in the national context, what is interesting about the Northeast Kingdom is for how rural it is and for its sort of economic structure and, you know, some of the other identifiers that researchers have looked at when considering partisanship, the Northeast Kingdom is remarkably liberal for what it is,” he says. For example, among people 25 years of age and older, the three counties in the Kingdom have some of the lowest rates of graduation from high school and college in the state, according to estimates from the American Community Survey. This is something that tends to track with a more conservative vote. But in 2016, Hillary Clinton narrowly won Caledonia and Orleans counties. Essex did go to Donald Trump. “And it’s just funny for us to sort of consider that, you know, given our own notions of how conservative the NEK is compared to the rest of the state,” Lachlan says. One quick note on religion, which our question-asker Walter was wondering about. In terms of the percentage of people who are identified as belonging to a religious congregation, the three NEK counties are *not* more religious than the rest of the state. This is according to the Association of Religious Data Archives at Penn State University. NEK residents know which negative stereotypes are associated with their region. Lachlan Francis makes one more really important point: that the Kingdom isn’t the only place in Vermont with a really strong rural identity. In his research Lachlan drew on the work of a geographer named Katherine Cramer, who wrote a book called The Politics of Resentment: Rural Consciousness in Wisconsin and the Rise of Scott Walker. He says the concept of “rural consciousness” was a useful lens for examining Vermont’s partisan breakdown. It’s also worth noting that while Essex is the least populous county, at about 6,200 people, Orleans and Caledonia are further down the list, at numbers 4 and 6. But again, when you talk to people there, the overwhelming sentiment is one of rural exceptionalism. Hear Northeast Kingdom residents sound off on what makes the place unique. Gary Ely, St. Johnsbury: Are you kidding me? I love this place. Come on! That’s the whole thing — get out of here if you don’t like it. And I think that people come here and they say, "I love this place." It’s peaceful, and you can go out and go fishing and you can hunt. It’s a great place. I just like it 'cause it’s home. It’s like, you know, at night when you go home and you get in bed. It’s kind of that feeling. There’s a security that lies in this area. And I love that part of it more than anything. It’s just, here it’s a different way of life. It’s just more peaceful. And it's not the traffic and a lot of all of those things that are more like cities. Here, I mean, you go out on the street. ... If you meet 50 people, I know 30 or 40 of them. Or more! Craig Goulet, Island Pond: You know, we know everybody. And they know us us. They buy gas here every week for their sleds. And you get to know 'em. Scott Wheeler, Derby: If you are prone to gossip, you better be careful on who you’re talking to. Because you never know who is related. Justin Veysey, Irasburg: My own perception as a person living here, it’s kind of like, "Well, if I didn’t go to high school with you, and my parents didn’t know your grandparents, then tough cookies, 'cause I’ve got all the friends I need, and I’m all set." Molly Veysey, Irasburg: I find that folks up here have their pathways generationally, you know? So there’s probably not a whole lot of need for people to go out and find new friends and new social networks, but having moved to a new area all together, I had to make that effort. I grew up in Johnson. And so when I moved to the Northeast Kingdom, when I moved to Irasburg, I thought to myself, 'Well it can’t be that different.' You know? There’s no way that it could be that different. But it is. There is a definite cultural shift. Two towns away is, you know, where I was raised and grew up, and still, you know, coming to Irasburg and living here, there’s an undoubted difference. Maybe it wasn’t a moment [of realization] as much as the process of realizing how lonely I was. I didn’t know anybody, you know, there were no real neighbors or people that I grew up with, there was no familial connections, so I was really alone. And I found that a lot of the people that I have connected with are also not from this area. John Rice, Lowell: I was outside, I’d been here for about a week. And these two gentlemen, I’d seen them drive back and forth, you know, I live on a back road. So they’re out, I don’t know if they’re road hunting or whatever, but they were out. It was fall. And they were, you know, having a couple pops and stuff, and they pull in, finally, and they introduce themselves, and they say, "So, where you from?' And I say I’m from Connecticut. "Oh, you’re a flatlander, huh!" And then the one guy just says "Uh, excuse me while I water your lawn," and I’m like, whoa. And then that was pretty much that, and they said, "Well, welcome to the neighborhood!" And they took off. I find [the Northeast Kingdom] it to be pretty accepting. See I grew up in a suburban situation, so I had a lot of white friends, went an all-white school, so this is really no different to me. Yeah, you know, there are slights, there are things, but that happens all throughout life, you know what I mean? Tamara Poginy, Lyndonville: I mean, if you have a job, count your blessings. Be happy you have a job up here because it’s not easy. If you’ve got one, hang on to it. Yeah, cherish it. But if you want to work up here, you travel. If you want to go to the grocery store, you travel. You know, you want to go clothes shopping, you need to go to Burlington. I mean, when they closed the Ames down several years ago up in Derby it was, everybody was frantic. 'Cause it's like, 'Now where do we buy our towels, where do we buy our underwear?' We had nothing. So it was nice when Walmart came in because then we weren’t traveling all the way to Littleton, New Hampshire. But yeah. Maybe that’s something people don’t understand about living up here. When something like that comes in, man, it’s big news. What’s striking about hearing everyone talk about the Kingdom is that in some ways the place they describe sounds unique — and in others, it sounds like it could be any rural community. Our question-asker Walter came along for some of our interviews, and after an afternoon talking to folks in Island Pond, he had sort of come to the same conclusion. "Maybe, like the individuals we talk to, maybe not them, but just the vocabulary they’re using, like, 'Oh, we need jobs, we need money, we need investment — like, that’s the national story. Are we just spreading rumors and all believing it? And creating that?" he wondered. "It’s like, is our myth-making making our reality?" Ultimately, when it comes to the Kingdom, that’s probably the more apt question: Is the myth-making making the reality? Sure, you can look at some numbers and some trends, but that’ll only get you so far. The story of the place has taken on a life of its own — for better or for worse. “It’s either the extreme, like we’re like this Never-Never Land, where the pot of gold is all over, or ... we’re like this rural slum,” Scott Wheeler laments. “And we’re caught somewhere in between … You know, we’re not perfect, but yet on the other hand is, we’re not Never-Never Land, either. There’s this binary reputation that the Kingdom has. And hearing what everyone in our interviews said, it’s tempting to think there’s a binary experience for people who live there, too. But Carol Dickson, the academic dean at Sterling College, in Craftsbury Common, says that’s too simplistic. Carol would know: She lives near Montpelier, and commutes to the Northeast Kingdom for her work at Sterling College. “So I am sort of traveling that insider/outsider distinction every day,” she says. Carol teaches writing and literature at Sterling, and a class called “Sense of Place.” In her conversation with Brave Little State, she talked about the writers whose work is deeply rooted in the Kingdom, such as Howard Frank Mosher and David Budbill and Julia Shipley, and about how all the stories about this place that George Aiken named — and also all the marketing of the Kingdom — have made it difficult to do what Walter asked us to do, which was basically separate fact from fiction or impression. “I guess I'm thinking about in that phrase, ‘a sense of place,’ like, what does that mean, right? And is there such a thing as a different sense of place here versus somewhere else?" Carol muses. "And I mean ultimately I get to the point where ... does it matter if it's in people's heads or if it's an actual thing? Because it's there, right? It may be just myth. It may be just the way people talk to one another. But that becomes a certain reality." Brave Little State is a production of Vermont Public Radio. We have support from the VPR Innovation Fund, and from VPR members. If you like this show, consider becoming one. Thanks to Greg Miller, Dylan Tester, Melinda Gervais-Lamoureux, Scott Gowdy, John Rice, Mike Strait, Craig Goulet, Justin Veysey and Tim Patterson for sharing their thoughts for this episode. Our editor is Lynne McCrea and our theme music is by Ty Gibbons, and all the music in this month’s episode was by Patrick Ross and his independent, Vermont-based Rock Farmer Record Label, in Newbury. We have engineering support from Chris Albertine. Special thanks to Liam Elder Connors and Bob Kinzel.